Oh my gosh! I have to do the contest this morning! I will do it and then post this! Oh shoot! Life goes wayyyyy to fast! O.K., off to do it! No, I think that I want someone else to do it! I will have it posted by this evening. I am going to have a local fishermen pull it out of the hat to make it more special. I could use planetary positions, a custom-made analog computer, and ancient Norwegian meditation techniques. Or, I could just spin a carrot. I think I will have Jim Erickson do it when he comes over at noon. Regardless, it WILL be posted by this evening! I have a sneaking suspicion that things may be happening out at Memaloose point. I am going to fish it on Monday just to see. Cool! Bill kindly put WWW.IFISH.NET on the back of his new super vee inboard jet! How fun! I just got back from my morning coffee and fishing...no bite, but then fishing in a stream with hardly any water is hardly a good bet. Well, off to do the contest work, hope the rain comes soon. I am simply going nuts with no fish! Oh yeah, this is kind of cool! I want one! A reader wrote in about the live Tillamook bay camera. Pretty cool, huh? Check out if you are going to fish inside or out of the jaws before you go! Jim Erickson just picked the winner!!! It is Jim Erickson!!! NOOO!, I'm kidding.... The winner is actually posted here! Congratulations!!! "To anybody fishing the Coastal bays now, realize that we have a "bumper car" atmosphere with the thousands of people trying to crowd into one hole. Here is a hot tip and it produces fish! : When the bars are safe, simply go off shore! Zig zag back and fourth in 25 to 50 feet of water, north and South, along the beach. The big secret is, don't fish over 12 feet deep, about 12 to 14 pulls behind the boat. Use blue label herring, purple cost too much! This is proven to be a very effective method for catching Chinook. However unorthodox, it works! Try it! It works!!! He also wanted to inform you of a fundraiser put on by The North Fork Nehalem chapter of the Northwest Steelheaders. The fundraiser consists of guided fishing trips provided by members of the chapter. Click here for more information. Bobber fishing has been fantastic at times at Roy Creek down to Mohler bridge. Many limits!!! Also the fish are starting to hit bobbers at the island above Nehalem with many fisherman giving it a try. As a side note, Jacks are being caught just below Aldervale. OK, time to feed Jim a ham sandwich before he goes..... See yaaaaaaa! Hey there... this is much to early to be up, this 5 O clock stuff... But I have to get to Astoria for church!!! Memalooose Monday, like I said.. Can't wait... going to use spinners. I just have a feeling, and I have heard some slight whispers of success. Have a wonderful day... I have no idea when it is supposed to rain, but I have this feeling it will be soon. I get this terrible feeling when it is sunny too much. It is boring! And there is no water in the rivers and streams! I like clouds to break up the monotony. I can't imagine living in Palm Springs or the likes where sun is present daily. ISH! Could it be the '96 floods that cause the lack of returning salmon in the Tillamook area? That is the question. Memaloose was somewhat slow yesterday with most guides reporting they saw about 4 or 5 fish caught all day. :( Oh well, it was pretty, and what an adventure to try out all these new waters! Someone wrote to me about bank access during the hog season, and I saw all kinds of neat places to bobber fish around Memaloose. I guess low slack is the time to do that. Go up past the launch, but before all the wood pilings. Plus I saw a good place right before the launch. I want to try it! Time to rename my site to Inet.fish!!! I can't seem to hook a fish, but I am getting really good at netting Bill's! Oh well, good practice for me, and I'll show him up when I bring in some 60 lb hog one day this season, right??? I hope! Sunday evening on the way back from Astoria, we saw several silvers jumping in the Nehalem right by the public boat launch, so we took out of Memaloose and drove to the Nehalem. On the way we called Jim and told him of how simply "eggless" we were this year, and he invited us down to give some nice eggs. So we didn't fish the Nehalem. Instead we sat at his table and helped him shake crabs. It was really enjoyable. He taught us how to hit them, and the meat just falls out. Hard to explain how though. You would just have to see it, but it sure makes it an easier chore. I thought it was some heavily protected industry secret!!! So we sat in his warm kitchen, shared stories and worked on crab. Yes, some made it to my mouth, and it was a real culinary delight! Now I need some for myself! Crabbing is good now. Went past the Nehalem and the silvers were still jumping around, teasing me to come try for them. Perhaps I will do that today. In the rain! Back to the flood theory. Will the returns be bad this year because of the 4 to 5 year old Salmon being affected by the floods of 96? That is what some local guides are contemplating here. It is odd and eerie out there on the rivers. At 2 O'clock, we had the river to ourselves. Weird! What is usually a bumper boat atmosphere is a ghost river! It does give me some time, though, to learn the ins and outs of trailer management. I would be much too stressed to help Bill with the trailer if the parking lot was frantic and busy, with the customary shouting of people in a hurry to get in and out. This way I can take my time and slowly learn how to do all of this. I am really enjoying learning, and I am seriously doing all right at it! Not great, but pretty darn good! Time to wake up the kids for school. I'll be back to report on my catch of the day. I hope that someone else will get a chance at the net!!! Just noticed that sometimes I forget to change the date on my updates here. Oops! Today is October 7th and I woke up to the sound of real fall. Wind blowing in the cracks of my open window! You know that whir and screaming sound of the coastal winds? It sounds like a storm, which makes me happy, and at the same time I wonder if we are still fishing today. We were going to go up bobber fishing, which I love!!! I was throwing sticks for Dee Dee, the black lab, yesterday and he mistook my finger for a stick and dug his teeth gleefully into my finger! As a person who uses their hands for most of my living... piano, etc., finger and hand injuries petrify me! I am O.K, though. It is just a little sore and swollen. No one is awake but me. Not even the sun. I love this time of morning, when the day is fresh and full of possibilities... of Fish! It is my turn! I have logged my hours for a big hog to come knocking. That IS how it works right? We haven't really had enough rain to bring the rivers up, but things look promising in the near future. The season has begun, and I will be patient, because before you know it, summer will be back!!! Yesterday I caught a cutthroat out in back of the house. I think that is all that is out there still. I am rambling. I need coffee. I need a fish. Time to rig up!!! Oh yeah, I ran out of sponsor products, so Bill and I are going to do the next contest thing. Win a trip to fish with us!!! I thought that would be a real kick! Fun for me too! Come on down to the Kilchis, the Trask, the Wilson!!! Let's catch fish! Well, I thought the dogs would keep things safe. Anyway, fishing... I had a blast yesterday catching cutthroat. Probably caught and released a dozen in a row. Just giggled and laughed out there by myself in the pouring down rain. The Kilchis river came up about 3 and a half inches. Enough for a salmon to come up I bet! Anyway, back to fishing...It was definitely bumper boats on the Nehalem today. We heard from Joe at the North Fork Nehalem hatchery, (Hi Joe, have you seen my kitty?) and he said nothing is showing at the hatchery. Weird. Don't know how they did on the Nehalem bay. Bill went up in the tidewater of the lower Tillamook, and the river was full of long faces and shaking heads. No fish were seen caught. Where is my cat? I have had this cat for four years, and I was so afraid of bringing him here. He is kind of spooky, and he was doing all right! I saw him last yesterday morning. I spent the day roaming the acres of brush, climbing through trees and thick underbrush, calling "here kitty...." till my voice gave out. I drove the roads, and talked to neighbors. I took the dog out and said... "MARK!!! Kitty!" No luck. Anyway, I caught those cutthroat yesterday and had fun. Took my son out later and hooked one and handed it off to him. Since then he has been out there twice on his own. That makes me happy, and rather proud! Oh! I saw the deer in the lawn! I was so thrilled! Two nice does real close and just strolling through the field! Then one of them got spooked at something and just went wild! I love the way they skim across the earth. They seem to float! Can't wait till the salmon come to visit me on the river here. Can't wait till my cat comes home. He will come home. The fish will come up the river! We said a prayer for Simba the cat at dinner time tonight. Not a prayer for him to come home. Just that wherever he is that he will be safe, and comfortable. I don't like to ask for direct things. I think we will have better results if we just ask for his comfort and safety rather than our happiness. Am I right? I don't know. All I know is that I miss my cat. I can't fish, I can't cook, I can't think and I have yelled at the kids twice today which isn't fair considering their unhappiness with the situation also. Things will look better in the morning. For now, I hope all you fisher people out there catch the heck out of those fish. And...... if you see my orange fluffy kitty.... Could you send him home? Nehalem reported 40 boats, 4 fish. What do you think? Good fishing? I am heading out to fish right now, and I will let you know the results. Not sure which direction we will head, but here's to hoping! Oh well... Had a nice trip out on T bay yesterday. The highlight of the trip was opening up the inboard jet and traveling near 60 mph.!!!! FUN!!! We didn't see one hook up, although we heard of.... let's see... maybe 10 caught? We followed the parade of boats from one place to another. "Hey! There's a whole bunch of boats at Bay City... lets go! Hey.... now they are at the Sheeps Corral ! Lets go! Hey, now they are out at the jaws!" So we zipped around like lost sheep trying to find the bite. Where are the fish? This is October! This is when it is supposed to be hot! Oh well. I am off to Astoria today. Going to get my car fixed and maybe try my jack hole, although the tides are kind of backwards to do that. It will just feel good to stomp around my old waters. Negative report, huh? Well!!!! I don't know what to say! I just can't hook up with a hawg.... I try, and try, and try to keep positive! I think I'll buy one... hook it up to my rod and pull it around behind me! The Guideshop is now doing updated reports again. It's the season! Thank you, Marilyn! I hate to say it, but fishing, all along the North Coast is just a little slow for this time of year. I am not giving up hope though. Not me. I am, however, wavering on giving up hope on my cat. Last night my youngest son, David, showed his lack of hope by finally letting go to tears about it. It broke my heart. He picked the kitty out 4 and a half years ago, and pretty much raised him. He was a big, fluffy 18 pounds of purring fur! He had a wild streak, being born of a family of barn cats, and would hide behind things and come out and glue himself to your legs!! Quite frightening at times, but he wouldn't hurt you. I called my neighbors back in Astoria to have them watch out for him. I have heard of crazier stories than cats traveling 75 miles to get home. I just can't picture him crossing Youngs Bay though. My Simba cat is somewhere safe and sound. Comfortable. Right? I miss him so much. Closure. Welcome to the household..."Munchies"! Got a new cat! A little kitty that was on death row at the vets. CUTE! It was like a dream. I mean it, or a story book. I went out to the river to play around with the cutthroat, and I didn't catch anything! Well, I did catch the first steelhead of the year... a smolt! Safely put him back and as the wind picked up I stared into the large maple on the other bank. A flurry of leaves floated down at me! Great big golden maple leaves swirling around in the air like I'v seen on TV or something! It was SO beautiful! I was right in the middle of it! My dog and I just stared up into this storm of gold and red, with the sunshine streaking through. It was so neat! Although the sunshine is getting frustrating to me, I do enjoy some of the finer things of fall. Like the crispness in the air, and the way my hands start to freeze after casting too much. I do love fall. No fishing for me till Saturday, but I will tell you if I hear anything. Dang.. it's the 18th? I'm sorry to everyone who enjoys this sunshine... It makes me depressed! Want to see something really disgusting? Go to the weather page and you see a bunch of smiling faces on big full sunshines. ISH! For days and days on end... the sun has been shining and drying up the water. Turning bright Chinook in the tide waters to a sickening color of red! All right... I'll stop. It is beautiful out, but when fishing is your life, well, I just can't get the most out of it! I am a patient girl.... but I see no hope in the future! If only there were a picture of a storm in the future! My kids are back to wanting to swim! In 50 degree river water in October! I have to go take my kids to school, I'll finish when I get back. O.K, I'm back. Thrill of your life, huh? So, the most I can do is tell you all I know about fishing around the area, and that isn't a lot, but here goes. First off, I am still getting cutts out of the Kilchis, but not as many. Then there is Tillamook Bay, not great, still a few fish out, but it is hit and miss, and the seaweed is thick at last cast. So, I wish it were better news, but that's all I have. Northwest Steelheaders meeting on Saturday. Fishing with the lot of them first thing in the morning. Whee! I have a nephew who is thrilled to come down and watch my kids, and get some fishing in in between. He is 14 I think, and fishing is his life! Can't wait for him to see this place. He'll be in fishing heaven! Fish on the walls! Fish pictures, fish books, fish mirrors, fish bookends.... fish fish fish fish fish! But best of all, a place to fish right outside the door! WHEE! Sometimes I can't get over the beauty of this place! Yes, the sunshine is a fish bummer, but as I was driving home from the school this morning, the long shadows and the sunshine in between, streaming through the tall trees of every color.... I don't know... It's amazing. It's breathtaking.... It's.....a fish dream come true! Right now a guy is outside with a... I don't know, what do you call it? A big diggie! (O.K., A samll lawn tractor...) Rolling the gravel that we had delivered to make a nice drift boat launch out the back lawn. And on that launch I will be able, on a rainy day, to drive down to the bank and sit in my car to fish. Well, what more could a girl ask for? A friend of mine and I were talking about flowers from boyfriends. I don't get um. I get casting rods, bobber rods... cured eggs....every girls dream, right? I love a good carton of fresh worms. Ooohhh baby! Nothing sends shivers down my spine more than when he whispers in my ear, "Wanna hook up the boat and go fishing?" :) Anyway, flowers die, fishing rods just keep producing. So, I'm a happy fishing girl. Going fishing in a minute or two, by the way. Out in Trask tidewater I believe. Just two happy kids, Bill and I, and hopefully a great big fish!!!! Hee hee! Let's tease the bull! Fished in the slough of the Trask yesterday. How do you spell it? Dougherty? The most fun I had was watching this extremely irate bull drool, bawl, and paw the ground at all the boaters passing by! I don't know about you, but I have been scared by bulls in my life, crossing pastures to access good water, and it is not my cup of tea. So seeing this angry bull with me safe, but close by in a boat was kind of fun! Nee nee!!! Can't catch me! I don't think the fact that the boat was red helped his mood any! He was SO MAD! I honestly thought he was considering going for a dip to go after us! Anyway, we scouted around looking for fish on the finder. Finally found a bunch of them up around the corner on the two bit property. (The two bit property that now costs Four Dollars to fish on.) There were fish under us and all around us, but they appeared to have lock jaw. We were doing everything we could to produce a bite, but it just didn't happen. Saw the famed Jack Glass on the water. (Hi Jack! Yes, you heard it on the net....!) Don't know how he did. I really didn't see or hear of any fish caught. Be careful around low tide with your boat. Lots of snags... Lots of trees close under the water. I played hood ornament/tree finder. Got to stare into the water... These are a few of my favorite things...when the bulls charge, when the trees snag....when I'm feeling blue.... I simply remember my favorite things.... and then I don't feeeeeeeeeel so bad! Gag me... its 6 in the morning, and sunny! Just checked the weather. No signs of water anytime soon. Is this really strange? Is this a drought? Off to figure out where my lines are going today. One last day to fish before the kids have five days off from school. One of my children in a boat is usually fun, but when the two get together, we get two giggly, pushing, shoving boys... You know the age! Anyway, my brother David is going out with Bob Toman and I can't wait to get their report versus mine. The guideshop reports that there is going to be a barometric change. Thank goodness! I hope it helps! Well.... Off I go... Gotta get in the shower and out to the river! yyyyyeeeeeeeeeeee haw! Thank you Stan, for another great article! Can you believe we got to stay out for 6 hours yesterday with the kids? They didn't even get bored! It was SUCH a beautiful day on the river yesterday... And out in the Ocean! I don't even really like to go out of the jaws, but it was as calm as a lake! Six hours, four rods, no fish. Oh well, you can't have everything! By the time we got to the launch, the fish checker told us, 60 boats, 14 fish. Not red hot out there! We fished the jaws, out of the jaws, the Ghost hole, and then on to the Oyster plant. At the Oyster plant we say Bob Toman and my brother just as they hooked into one. My brother didn't get one, I don't think. Anyway, saw a net friend, Ray, in a boat called "Hawaiian times". That was fun too! Hi Ray! Well, school conferences today, business on Friday, fishing the Nehalem with the Association of Northwest Steelheaders on Saturday. I guess they are doing OK in the barn hole. The bobbers go so deep they come back up pressurized into capsules! Fun! See ya on the water. Watch for the ifish boat! Fell asleep so soundly last night that I forgot to take my contacts out. OUCH! So I took them out for 5 minutes and put them back in again... Well! I have to go fishing! Rain...... oh sweet water that fall from the skies! It's not here yet, but I know it's coming! and the fish! The fish will come up the rivers! And my creek like river.... will turn into a real river! The rivers will turn muddy and dark, and the leaves will flush out, and the dust on the roads will clear, and everything will be clean, and fresh and new! I Love Rain! I love rubber boots! I love wet hair, and frozen hands and warm pick ups at the end of the day! I heard the Nehalem has been producing fish dragging eggs. Kind of a dragging/back bouncing procedure, and I am going to give it a try today! Off to the shower I go! Ho ho! I am soooo tired. Can't write much cuz I have to rehearse for tomorrow and go to bed. Just had to tell you.... Caught a 40 lb Chinook, and we caught three others.... 17, 22, and 35. The 40 lber I let go, because of slightly bad color, and anyway, what are we going to do with all of this meat? What an absolute blast, and the 40 lber was a real rush. (Like I can't move my arm!!!) Anyway, it was all happening on the Nehalem. The fish are here! Good Morning! It's Monday! That means school for kids and fish for Jennie! NOT! My Andrew, my oldest, is sick again.....Wah!!!!! They have been home from school for three days last week. Wednesday no school for the teachers to prepare for conference and then Thursday and Friday for conferences. Friday David got sick, and now he is well, but Andrew must have caught it. Poor kid. Why don't schools have school anymore? I am still going fishing. I have to! Now just to choose where! The Kilchis is still a little bitty stream. Could fish Memaloose. Maybe the tide water of the Trask.... Could fish the ghost hole. Seems the Nehalem was off the bite yesterday, and I think it is barometer related. It went way back up yesterday. It is falling again today. Maybe the Nehalem.... Maybe the fish went up with all of those baits in the water the other day. Too much activity for all those fish! Maybe they are in the barn hole today. Let's just see where I end up. Planning is half the fun! Finally got ten pounds of eggs out of the fish Saturday. I have been hen hunting for too long, and finally! Eggs! So we are curing them in all different kinds of ways. Today I am going to try something I got in the mail from Dolphin Lures. Go check them out! Looks good.I am going to try the shrimp. Can't wait! Byeeeee! I always fall in love with rivers that are not publicly gauged on the net. First the Necanicum, now the Kilchis. At least I live on this one, so I can really know where it is at. We even built our own little river gauge that I can see from my bedroom window. O.K., so it really rained yesterday! And I was singing rain praises as we were launching the boat at Nehalem yesterday. And I was still singing as we slid up the river and began to fish. My enthusiasm started to wain a little as my rain proof pants started to lose the rain proof part. And the wind began to howl... and I noticed many guides heading back to the take out. I can take rain... I love rain. Wind, however, is not my fishing friend. I do, however, remember a stormy day in August.... My friend Ben called me on the phone. It had been dry for weeks, and he wanted to head out to the Columbia river beach to fish. Crazy.... but we did. And we caught fish, after fish, after fish! It was blowing us sideways, and you couldn't even tell you had a silver on until you reeled in, but every time we did, we had a fish! Limited in like an hour! What fun! Yesterday was not like that. We, like many others gave up to the forces of nature. Boo hooooo! And now it is going to be sunny again? WHAT???? Oh well. I am convinced that this is the start..... the very tip of the start of the beginning of salmon season on the rivers upstream. I feel like a kid waiting for Christmas. I am, however convinced that this may not be the season of my dreams. That the 96 floods may have damaged these 4 year old returning salmon. I would love to have statistics, if anyone has them, what the percentage is of 4 to 5 year old returning salmon. Is anyone doing any studies on the effects of the flood on these incoming salmon? Please, someone, prove this theory wrong! Let me wake up some morning with my patio door cracked open and hear salmon thrashing joyfully about in the waters outside my door!!! All I want for Christmas is fish jumping, some technical computer person who loves fishing with extra computer equipment that would enable a river cam on ifish, and a nice pair of woolly slippers..... cuz MY FEET ARE COLD! Or hey, guys..... if you think this would be fun or useful....we could all go in together and buy one! If you are interested, e mail me! Wouldn't it be fun to watch a fish being caught on the Kilchis? The Ifish cam... the Icatchfish cam! Bill and I are buying each other a weather station from Davis Instruments for Christmas.... Or at least we are dreaming of one. And you can configure these to display current conditions on the net! Ahh technology! Just as I learn one thing... three other manuals await me! I can't believe it! It feels like Christmas! The water is coming from the skies, and I can just smell all of those salmon coming to visit me! The rain gauge says 1.3 inches since this morning! WHEEE HAH! Bill is heading out to check out river gauge.... I can't wait! I look out the bedroom window, and see the color of the water. It's different! It's....leaf stained and almost brownish! Swoosh go the leaves down to the sea....I want rapids, baby.... I want large rolling waters!!! I want..... A RIVER!! I bet Bill that there wouldn't be any boat trailers at Memaloose. Wrong... I lost. Three very serious (and perhaps desperate?) parties out. What weather to fish in! Well, I guess I went out this morning too. I stood there in the pouring down rain from the heavens and casted eggs. Desperate. Yes. The river has come up 4 inches!!!!! 7 inches above last weeks low water mark of 0. All right, so I am near death with excitement but I will make it through this... I will make it through and live to fish this water that is so near to being what I dream of. The rain clothes are out, my hip boots are out. My rods are ready, and my tackle.....well, it's a mess, but I'll work on it! There were lots of bank fisherman at the two bit hole. Wonder how they are doing. I did see a splash in the Kilchis tidewater... I wonder..... Are there salmon out there now? There could be! Barely! I want to fish! NOW! Gosh..... I think I will! WOW! The river is HUGE!!!! I have been busy volunteering at school all day, so I am going to update some pages, and get the heck out there with a bobber! YEEEEE HAWWWW! It's even clearing a tad... I have rapids out in front of the house! It is up 2 feet! A real river, guys! A REAL RIVER!!!! I think I am going to flip out if Bill doesn't hurry up! I told him I wouldn't fish until he was ready. He is the ultimate organizer. I put stuff in my pocket and go fishing. He has to have everything cleaned, polished, sorted, and assorted, put in alphabetical order, and filed appropriately. I respect this. I admire this. But I don't have the patience for this this particular morning! The river is prime! I am prime! I want to fish!!!!!! Duck lakes and full rivers have nothing in common. Dee Dee is a very enthusiastic hunting dog. Loves the water like I do, but with more energy. Much more. And much less fear. Dee Dee thinks that bobbers are for fetching. I didn't realize this. 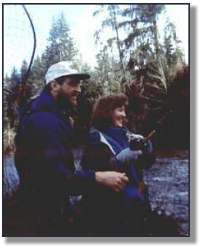 My first cast, and off plunges Dee Dee into the depths and swift current of what she remembered last as a small creek. I was absolutely panic stricken to watch her helplessly float down stream while her strong, beefy lab muscles worked furiously, but her futile attempt failed to bring her to shore. She swept down and around the bend faster than a bobber cut loose. The trail that I used to wander down the Kilchis on was underwater leaving me brush and bramble to struggle through to try and match the furious pace of the dog swept away by the water. Dee Dee went out of view 1/4 mile down the river around a corner. I turned back in horror to go get the kids, the car, I didn't know what. Then she reappeared across the water, and gleefully started across again, obviously forgetting the lesson she should have just learned. "No!" I shouted! "Dee Dee, No!" But she plunged in and back down she went. I ordered my youngest to stay on the river bank, and to call my cell phone if she made it back, and I struck out in my car to the next access. Out of my car, my heart beating like I'v never felt or heard. Boom Boom..... There she was, staying even in the water, while fighting the tide. Making no headway. She could see David up the river, and hear my shouting from my perch below her.... She was confused and scared. Well, she made it to the shore... Finally.... and went for David as the place I had chosen to stop was a rock embankment with little hope of me hoisting up 90 pounds of black lab. What a day. What a nightmare. What a dog! later...Well, I just went fishing.. Tried a bobber, tried drifting bottom. Caught a cutthroat, but that's all. The water is beautiful, and in prime shape except for a few leaves. Going to Astoria on business all weekend. Boo Hoo....No fishing. The Kilchis: A few chums were caught at the Logging Bridge. I fished for a couple hours. Got a cutthroat. :( My neighbor hooked five in his prime spot. A Chum, 3 dark Chinook, and one bright. The Trask: Dam hole is full of darkies thrashing about. Two nice brights that I know of caught. One 45 lbs. Nice pictures at the Guideshop. The water is clear. The Wilson: Many boats went in. No reports yet. After our intense rain Thurs. and Fri. which raised the rivers substantially, rivers are dropping and clearing very quickly, perhaps too quickly. Sorry not better news! But do have a happy and safe holiday!